Clothing/Jewelry Description A black coat and black shoes. Medical Conditions Krulce is an insulin-dependent diabetic. Her needles and insulin were left behind at home. Krulce was last seen eating at a restaurant at Martinique Apartments on Baum Boulevard in Pittsburgh, Pennsylvania on November 19, 1959. She worked as a secretary for the United Fund of Allegheny County, living at Martinique Apartments on weekdays and spending the weekends at her mother's home in Strabane Township. Krulce never showed up for work on November 20 and has never been heard from again. Her clothes, and jewelry were left behind in her apartment, as was the insulin and needles she needed to control her diabetes. 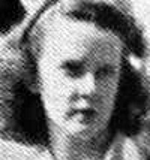 Mary Ann Verdecchia, a child who also lived in Martinique Apartments, disappeared in 1962, three years after Krulce did, and was never found. There's no indication the two cases are related, however. Human remains found in the Garfield area of Pittsburgh in 2018 were initially thought to be Krulce's, but investigators now believe they are not hers. Her disappearance remains unsolved. Updated 2 times since October 12, 2004. Last updated March 5, 2018; two pictures added, details of disappearance updated.